← Why Barware Should Be #1 On Your Gift Shopping List This Holiday Season! The holidays are approaching! Time to get our holiday decorations ready in preparation for the upcoming festivities! As each year goes by, trends continue to change; but the one timeless decorative piece that we all know and love is the Crystal Ornament. Ornaments have been a lifelong tradition during the Christmas time. Everyone knows that this time of year is the season to pick out your favorite Everest tree with your family and decorate the tree with little embellishments, making the holidays extra bright and joyful. Ornaments are the perfect gifts to give your friends, families, and co-workers especially when they can be personalized. Personalized gifts make everything more meaningful and personal for your recipients. Make this holiday season special for you and your loved ones with these easy and effortless personalization tips! The classic circle ornament is one that never gets old! Give your friends and family members the Waterford Beveled Circle Ornament this holiday. Engrave on it their names or initials and a sweet and thoughtful message. Putting a bit of thought and love into this small gift will mean the world to them when they realize this was created for no one else but them! Giving gifts to your significant other shouldn’t just be on Valentine’s Day. Show that special someone a bit of your love with the Premium Heart Ornament. Ornaments don’t always have to take on the classic look. They can be fun and represent how you feel about the other person. With this beautifully heart-shaped ornament, you can engrave both of your names on it with a simple “I love you” or “Happy Holidays” to express that your love for them lasts all year round! As we near the end of 2017, it’s also time to celebrate with your co-workers and boss on your year-end successes! 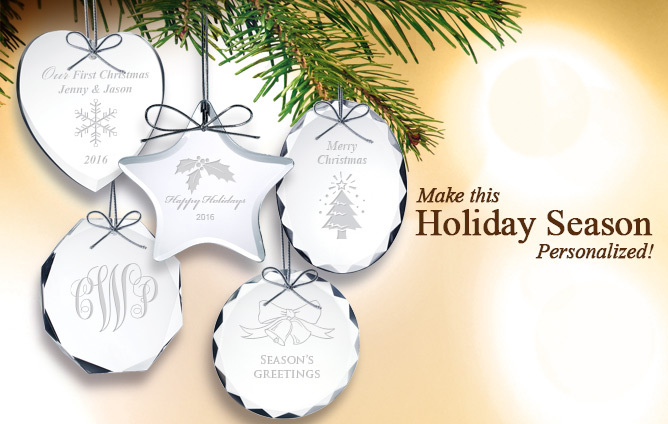 Give them an engraved Premium Star Ornament that has your company logo, recipient name, and a holiday message on it! This star-shaped ornament, in itself, represents light and best wishes. So, giving this personalized ornament will be a special reminder to your co-workers and/or boss that we’ve ended the year with a huge success and will look forward to many more in years to come! Here at Crystal Plus, we like to help create unforgettable memories for you and the special people you have in your life. With these personally engraved ornaments, this holiday season will surely be merry and bright for you and everyone around you! Season’s Greetings and Best Wishes!